OTTAWA — The rate of new home construction in Canada slowed in February to its slowest pace since July 2009, with much of the country caught in a deep winter freeze. Royal Bank economist Laura Cooper said the bulk of the weakness was concentrated in Ontario and Atlantic Canada where extreme cold and severe snow storms dominated in the month. She said homebuilding activity should improve as winter recedes, although the uncertainty in crude oil markets will temper new home construction in the Prairies. Canada Mortgage and Housing Corp. said Monday the seasonally adjusted annual rate fell to 156,276 units in February, down from 187,025 in January, led by a slow down in multiple-unit projects.Economists had expected a pace of 179,000 units. TD Bank senior economist Randall Bartlett said harsh Februrary weather had an impact but "the trend is clearly toward weakness in the housing market." "While the Prairies fared better than most regions in February, the sharp decline in oil prices and trend decline in the housing market suggests that continued weakness can likely be expected, at least over the near term." 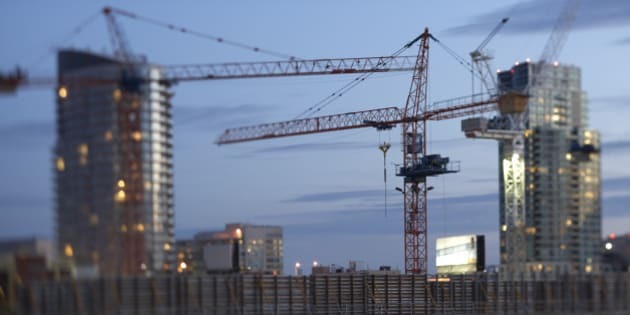 CMHC said the rate of new home starts in urban areas fell to 140,722 in February, down from 171,950 in January, as the rate of multiple-unit starts fell to 86,214 units from 115,123 in January. Single-detached urban starts decreased to 54,508 units in February from 56,827 the previous month. Rural starts totalled 15,554, up from 15,075.Regionally, urban centres across the country all saw a slowing in the pace of new home construction. In urban centres in Atlantic Canada, starts plunged to 2,491 compared with 8,341 in January, while Quebec saw starts drop to 23,815 from 26,498. Starts in urban centres in Ontario fell to 42,617 from 58,785, while urban centres on the Prairies dropped to 49,426, compared with 53,261 in January. Urban centres in B.C. saw starts fall to 22,273 from 25,065.The six-month moving national average in February was 182,137 units, compared to 188,761 in January.